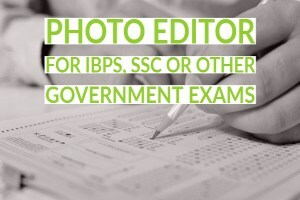 IBPS, Bank Po, Banking or other Government Exam need you to upload your picture or photo within their stipulated size and dimension. There is a free web-based photo editor, online editing tool available. But I am showing a simple software with some simple steps that can help to solve your problem easily, even without a professional knowledge in photo editing. First of all, one must download and install a software called Paint.net. Now the first thing is to resize the picture within given dimension. Open the picture with paint.net. go to image. then click on resize Box will open, in that box, click On absolute size, unpick the radio button “Maintain aspect ration”. Now select the desired Width and Height of the picture, click ok. your picture is now resized to your desired height and width. Its time to save your picture, Click File, Than save as, give any file name, in saving save as type select JPEG from the drop-down menu. Click save, Than you will be greeted by another box, save the configuration. The task is simple there is a quality box in the left size and file size is shown in bellow parts. Whenever you increase the quality your file size increases, so set it wisely, keep in mind the size you want. the result will show in the middle. after that click OK. Your picture is saved, and all the best, who are doing it for the exam.